Hello all. I’ve finally decided to stop lurking and join in some of the discussions. I’ve only been hanging around for about the past month. We (my boyfriend and I) recently took in a foster dog that is also a tripod (boxer-mix), and ever since Tigger came to live with us, I (and Tigger) have doing our darnedest to work on the boyfriend so that Tigger can stay permanently. Tigger was born in a shelter, and the dogs in the adjoining cage pulled her right front leg through the fencing and ripped it off. Luckily the shelter did not put her to sleep, but allowed a vet to take possession of her where she then spent the entire next month of her life recovering before a local rescue group took her, and then in turn she came to stay with us. 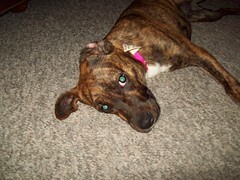 Now Tigger is learning the ropes as not only a tripawd, but how to be a puppy. This is the first home she’s ever been in, and she’s very appreciative, learning all of the doggy rules and trying to make sure she’s no trouble at all. She goes on bounces (walks) with our other three dogs (hence also why the boyfriend keeps insisting that we’re not keeping her–full house) and does remarkably well. She’s learned to play chase, ball, is house-broken, and can work cute like no other foster dog we’ve ever housed. I’m also a freelance writer in my spare time and not only wrote an article on caring for tripods, but found this place and included a link to Tripawds. I’ve also been eyeing that ruffwear harness for my little Tigger-tot. It would seem Tigger’s grow on you whether you like it or not. It definitely seems like Tigger has an angel on his side – first the vet taking him in and now he has you. Tigger – you keep up the cute routine – how can the boyfriend help but fall for all that cuteness. I have noticed ever since taking in the tripod that they (tripods) don’t appear to be as "adoptable" as other dogs on the rescue website. The group we work with, SaveUnderDogs, currently has three tripods and one crippled pup, and people just don’t seem to be as interested in "handicapped" dogs. Am I correct in this line of thinking? Tigger has been listed on the website (it uses petfinder.com) for over a month, and not a single inquiry. The four-legged dogs seem to get regular inquiries. I suppose I should also factor in the current state of the economy and the fact that more people are without jobs and homes. It does seem a bit sad though, especially now that I am enamored with our foster tripod. If they are all as sweet and smart as Tigger, then I can only say that people don’t know what they are missing out on. Oh! Milestone! Tigger has learned to get in and out of the truck all by herself now. I have been taking her around to meet people from my office and dogs of other friends and was lifting her in and out of the truck, but now she wants to be a big girl and do it all by herself. 🙂 When we take our daily bounce through the woods, she’s taking to bounding over fallen logs in an amazing steeplechase fashion. She sizes up the jump, contracts, and springs over it. And to think when she first came here I was so worried about her having difficulty learning how to adapt. I guess it’s a good thing that if she had to lose a leg, that it happened to her at such a young age. LOL Absolutely nothing wrong with being cute. You get more treats and petting that way. Sounds like Tigger is adjusting well, and yes, pups who lose a leg young seem to adjust to the change quicker. I think that most people associate a missing leg with health problems (usually the case). It takes a special person to lovingly and whole heartedly take on a special needs dog. Having worked with rescue I would rather wait a month to find the "right" home for a dog. Sounds like Tigger found one with you. Thanks for joining the discussion forums Bev! Ya know … the wonderful thing about Tiggers is … that Tigger’s a wonderful thing. And your little Tigger is definitely living up to the reputation. Thanks for taking such good care of her, and thanks for sharing her story! And congratulations to her for figuring out the truck hop. But do be carefull of her jumping down onto that one front leg. That’s where the harness came in extra handy for my people! … they (tripods) don’t appear to be as "adoptable" as other dogs on the rescue website. Your thinking is indee correct. That’s why we started the Tripawds Rescue Forum here in this site … to help all our three legged friends find a home. Please feel free to add any dogs you know of and link to their shelters. And oh yeah, we’d love to check out the article you wrote. Thanks for mentioning us! Can you post a link to it? I’m hoping to do more articles on tripods in the future. I hope you don’t mind that I embedded a link back to your web site. In all of my research, I kept gravitating back to this website and all of the wonderful information you’ve gathered. Once I get into the swing of things and teach Tigger her alphabet, I’ll let her post a message or two. She’ll probably tell you how much she loves launching a full frontal assault on our Great Pyranese, Freya, (talk about size difference and she’s also another rescue dog). In addition we also have a 13 yr old wolf hybrid, Kodiak, who Tigger delights in giving ear kisses and trying to take food away from. Apparently he’s mellowed in his old age and tolerates her antics with a couple of grains salt. My own pound puppy, Dakota, a Finnish Spitz mix, is an 8 year old bundle of energy who is exceptionally jealous of all the attention that Tigger steals away from him. Freya and Tigger are best buddies and Freya will actually lay down on the floor to get to Tigger’s level so she can play better. Rescue dogs are awesome. Great Artticle Bev! Good info and helpful tips. Thanks for linking back to us! Here’s some help for embedding movies in forum posts. Can’t wait to see that blur in action! Excellent! I hadn’t even thought about embedding the video. Let’s see how I do. And one more really quick one. Tigger is fast. WOW!!!! She runs like my Calamity does!!! 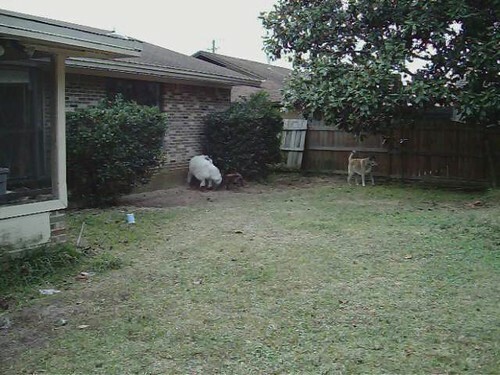 Maybe we’ll figure out what’s up with our video camera & take some of our tripawd too!!! Yep, I think she’s part racehorse. We have a new Sony camera. I’m just not savvy to those sorts of things, but I know our camera does video too. I wouldn’t know how to begin to do it though!!! I’m a PHD (push here dummy) sort of gal! LOL!! Maybe I can get hubby to make a video of her!! We frequently have company over, and Kris introduces all of our dogs and "the foster dog." Naturally I counter with "she’s not a foster dog!" Today, after I countered, he replied, "it’s under discussion. " I came home after work (after stopping off at the pet store) with a bag FULL of harnesses and leashes (they were all clearanced for $2.99 each!) and dumped them on the floor and we let Tigger pick which ones she wanted first. She chose a lovely purple harness and posed pretty for me while I sized it and put it on her. Once she gets used to this one, I’m going to buy her the ruffwear harness. Progress is a good thing … and acknowledgement is the first step!